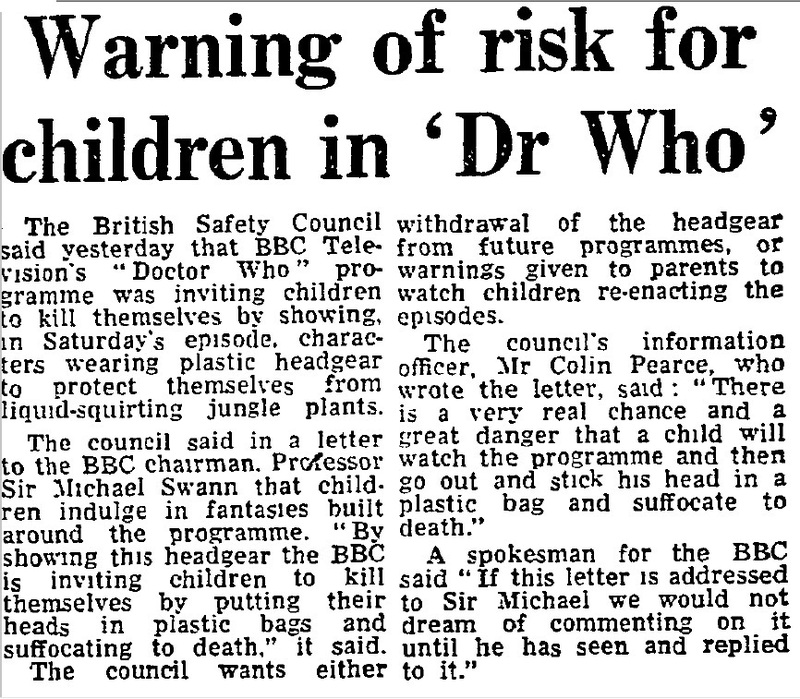 The British Safety Council said yesterday that BBC Television's "Doctor Who" programme was inviting children to kill themselves by showing, in Saturday's episode characters wearing plastic headgear to protect themselves from liquid-squirting jungle plants. The council said in a letter to the BBC chairman. Professor Sir Michael Swann that children indulge in fantasies built around the programme. "By showing this headgear the BBC is inviting children to kill themselves by putting their heads in plastic bags and suffocating to death," it said. The council wants either withdrawal of the headgear from future programmes, or warnings given to parents to watch children re-enacting the episodes. The council's information officer, Mr Colin Pearce, who wrote the letter, said : "There is a very real chance and a great danger that a child will watch the programme and then go out and stick his head in a plastic bag and suffocate to death." A spokesman for the BBC said "If this letter is addressed to Sir Michael we would not dream of commenting on it until he has seen and replied to it." APA 6th ed. : (1973-04-09). Warning of risk for children in 'Dr Who'. The Guardian p. 7. MLA 7th ed. : "Warning of risk for children in 'Dr Who'." The Guardian [add city] 1973-04-09, 7. Print. Turabian: "Warning of risk for children in 'Dr Who'." The Guardian, 1973-04-09, section, 7 edition. This page was last modified on 16 July 2014, at 22:55.